So far Steven Gugilev has created 18 blog entries. Having a nice time in Miami doesn’t have to be that hard. In fact, with the beautiful scenery and absolutely amazing fun locations, all you have to do is show up. However, there may be a few ways for you to turn things up a notch. Miami is home to some of the most exquisite tastes and while all of that could be really overwhelming and expensive, you can definitely have a taste of this lifestyle while on a budget. Renting out a Porsche in Miami is as easy as making a few calls. There are lots of car rental services in the city that offers an impressive line of cars and can guarantee that you get exactly what you need to look as classy as possible. But then, when seated behind the wheels of a Porsche, you don’t really have to try that hard as the brand seems to do the job of a super car while showing of a suave sense of style. With the company incorporating some the latest technological designs and ground-breaking features that make for a comfortable drive, there will be no argument if one were to say that the Porsche was probably designed to cruise the city of Miami. Things like engine performance and exterior beauty gets handles and all you have to do is lay back and have a good time. With the wide array of new models and trim lines, you can sit back and have a blast. Simply rent a Porsche and let the streets of the city show you what it has to offer. Not a lot of cars exude the red fiery appeal like the Ferrari brand. Being one of the leading manufacturers of sports car, you could definitely refer to it as the sport car giant and you wouldn’t be wrong. Perhaps, the most fitting environment for a car of this caliber is the city of Miami. Beaches, clubs and bars, you definitely want to look your best when you show up and the Ferrari does just that for you. There are lots of fun spots to see in the city of Miami and if there is one thing that is common to them all, it is the taste of exotic cars and astounding automobile that you get to witness. Starting off from the beautiful weather to the fleet of luxury cars you encounter, you certainly want to go for the best choice of drive train when hitting the road. The cosmopolitan playground awakens that desire to liven up your time in the city and turn a few heads with an engineering wonder. 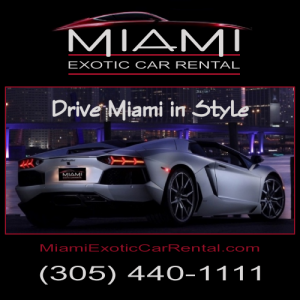 The great thing about the city of Miami is the vast array of luxury car rental services that are provided and allows you to get some time alone with the car of your dream. Forget about the restriction that buying a car brings or even the thought process that may be involved in processing full ownership. When in Miami, you could easily rent out the latest Ferrari brand from a car rental service and take it for a spin.